"I made this sandwich by combining my 2 favorite sandwiches, and salad, together. The result was delicious!" Preheat a skillet over medium-low heat. 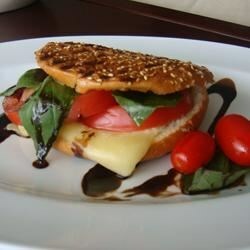 Sprinkle cut sides of roll with balsamic vinegar. Layer one slice of mozzarella cheese, tomato slices, basil leaves, and the remaining slice of mozzarella cheese on the roll. Close sandwich; rub outside with olive oil. Place sandwich in preheated skillet; top with another heavy skillet to press. Cook until bread is toasted and golden, about 3 minutes. Flip sandwich; top with skillet. Cook second side until toasted, about an additional 2 minutes. This is actually my recipe and I also put some sliced red onion on there as well. Enjoy! AWESOME! Loved it! I added a few sprinkles of sea salt & ground pepper to the tomatoes before pressing on the panini grill. This is a keeper. Thanks for sharing your recipe, Mrs. Williams!